"I don't know," he said. "I didn't even think about it. For me, it's just about making sure that stuff was right with my body." "We're trying to build on that," he said. "We're trying to get better. We've got 12 games to do it." "We just didn't hit shots, we didn't shoot well and they shot well when they needed to," he said. "They were having their run and we had to stop the bleeding and we just didn't a good job of that." 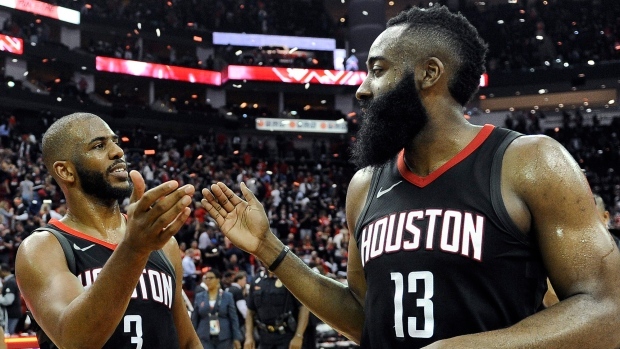 The Rockets shot 42 per cent from long-range to improve to 13-2 this season when shooting better than 40 per cent on 3s. The loss leaves the Timberwolves in 10th place in the Western Conference. Although they haven't been eliminated from playoff contention, their latest skid makes it unlikely that they'll be able to move into one of the top eight spots and make the post-season. "The odds are against us because a lot of guys are hurt and aren't able to play," Wiggins said. "But everyone's role is to step up and keep fighting until the end."